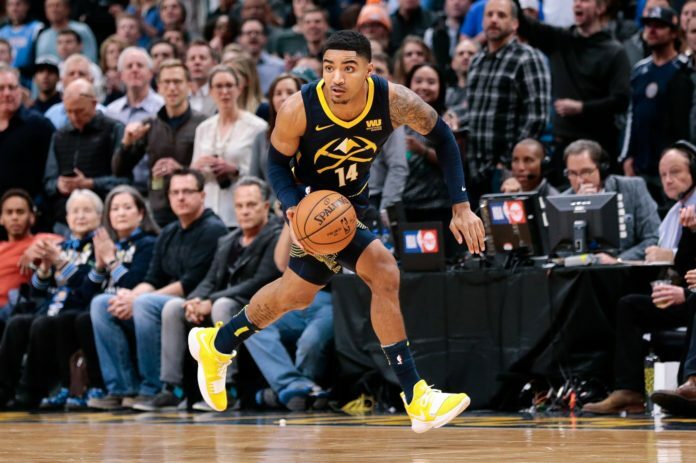 The Denver Nuggets managed to defeat the Oklahoma City Thunder in thrilling fashion after shooting guard Gary Harris drained a last-second three-point shot to solidify the 127-124 victory. 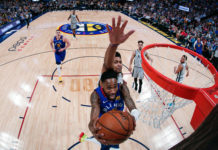 After youngster Jamal Murray was put in his place by getting swatted by reigning league MVP Russell Westbrook on the Nuggets’ opening possession of the game, Denver managed to settle in with quick scoring from Harris. Harris knocked down a quick three-pointer, and pull-up jump shot to score the Nuggets first five points of the evening. From there, the game opened for the Nuggets as Nikola Jokic settled into a groove in all aspects. Wheeling and dealing, Jokic went on to record 12 points, six assists, and four rebounds in the opening period. He even had a dunk! The Nuggets finished the first quarter with a 40-33 lead. The second quarter was the Jamal Murray show. Murray matched the nine spot he put up in the first quarter only this time he added a bit of pizzazz. 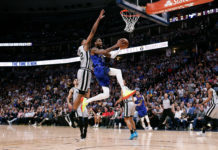 Murray was clearly feeling himself in the second quarter, and when Thunder big man Steven Adams tried to defend him at the three-point line midway through the period, he embarrassed him on national television which left Denver’s bench in awe. 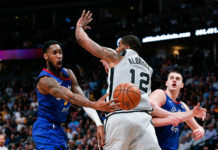 Murray’s nine points paired with other offensive contributions from guards Will Barton and Emmanuel Mudiay gave the Nuggets a comfortable 72-57 lead entering halftime. Oklahoma City came out firing in the third quarter by going on an 8-4 run which nearly cut Denver’s lead to single digits. Head Coach Michael Malone proceeded to call a timeout with just over 10 minutes to play in the third quarter to help refocus his team. The Nuggets got back on track following the timeout by loading up the points to ramp their lead back up to 81-67 by the 8:40 mark. The Thunder managed to slash Denver’s lead to single digits in the fourth quarter. Westbrook and fellow superstar Paul Geroge led the charge for Oklahoma City as George managed to hit a step-back jump shot with 2.0 seconds left to tie the game at 124 apiece. With the game knotted up, coach Malone drew up an inbound play that appeared to be designed for Jokic to take the last shot. After all sorts of confusion on the play, Jokic wound up dishing the ball out to Harris who paused for a moment before hitting the game-winning shot. Harris finished with 25 points, three assists, and three rebounds. Jokic logged his ninth career triple-double with a stat line of 29 points, 14 assists, and 13 rebounds. Murray also finished strong with 33 points, five assists, and three rebounds. The Nuggets will now set their sights on the Golden State Warriors who will pay a visit to Pepsi Center on Saturday.